For several years, Kay George’s Art Studio on Rarotonga held an exhibition dedicated to Polynesian voyaging. Usually, participating artists bought or made paddles which they then decorated in the medium of their choice. Making a paddle using my textile techniques did not appeal to me. 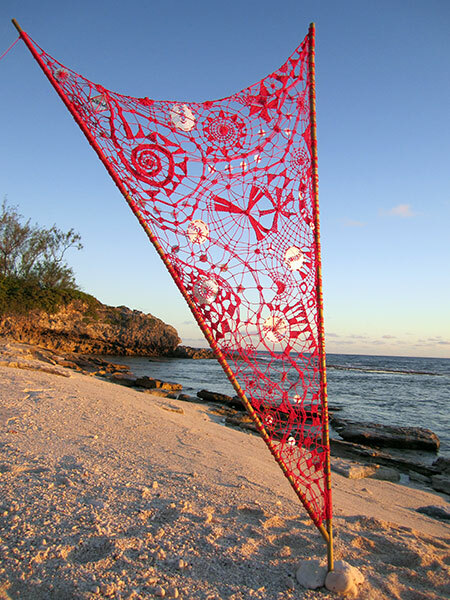 When I first arrived on Atiu, hand-sewn delicate needlepoint lace had been my favourite technique and medium of expression. For some time leading up to the exhibition, I had been toying with the idea of translating needlepoint lace into a large-size work. I decided to make a sail-shaped lace, using long bamboo poles to attach it to. An empty mosquito screen frame in my home provided the ideal support for my piece to work on (far right). 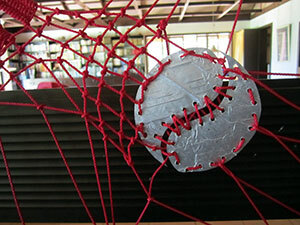 I wanted to let the lace develop its own shape as I went along. Since the work was meant to be shown outside the gallery and thus exposed to varying weather conditions, my material choices had to be weather proof. I used Polyester builders line which meant that I could melt off threads and knots. Half way through the work I felt that I should introduce another element, stars, because the connecting lines of the developing lace reminded me of the navigational stick charts of ancient Polynesia. I experimented with laminated aluminium foil and discovered that I could cut shapes out of it which were easy to incorporate into the lace (right). I arranged larger discs in the formation of the Southern Cross (right) and let smaller discs meander through the work just as the Milky Way appears on our Southern Hemisphere night sky. The lacy sail received a lot of positive feedback during the exhibition and a picture of it even featured in a review in the Cook Islands News. 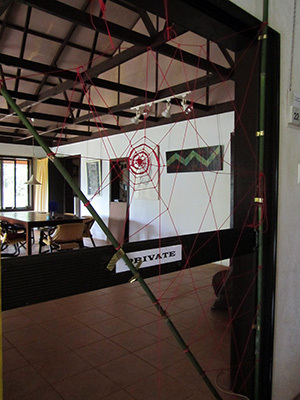 It has been acquired by the University of the South Pacific, Rarotonga (Cook Islands) to be displayed in their foyer. The Red Sail has also been included in their brochure.